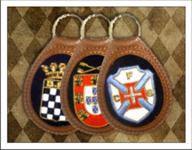 Key fobs are handmade of bullion gold and silver wire and black or brown leather and create a unique, yet traditional, keepsake that can be enjoyed by all. Genuine bullion leather feature superb detail using bullion wire, cotton & silk. A perfect compliment to your blazer crest, tournament gift or resale in your shop. Contact us for ideas and packaging concepts in order to meet your specific requirements. Email your logo to art@bowlerandblake.com for a FREE, no obligation art concept.